The smallest bottle in the Square Juice Bottle Range. Our 250ml is a handy lunch box size plastic bottle. Great for children’s juices and flavoured waters and a safer packaging alternative to glass. Buy in single or bulk depending on your need. Handy lunch-box size 250ml Square plastic juice bottle, made from PET plastic (Polyethylene Terephthalate) strong and flexible and a lighter alternative to glass (Saving on transport costs). The plastic has a glass like appearance, great for enhancing the natural beauty of the product within. With no minimum order quantity, our juice bottles are ideal for home juicing, as well as cafes, takeaways, farm shops, delicatessens and food markets. They’re great for fresh fruit juices, smoothies, vitamin waters, natural energy drinks and more. 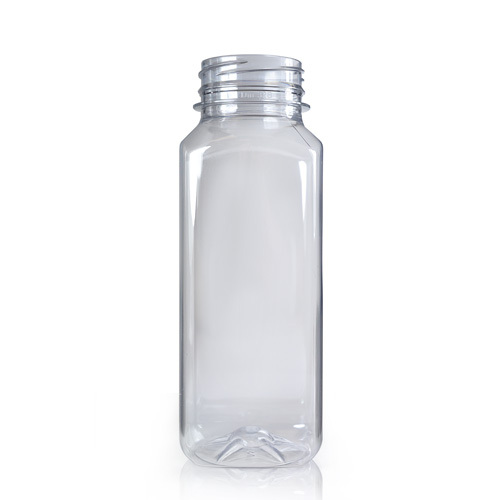 Made from strong, food grade PET plastic, this is an industry standard juice bottle that’s suitable for both home juicing or professional soft drinks ranges.